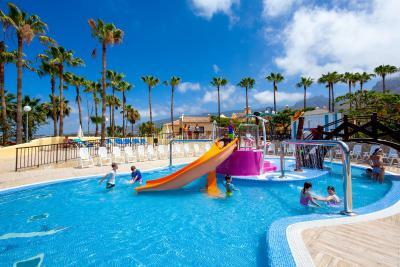 Lock in a great price for Tagoro Family & Fun Costa Adeje – rated 8.5 by recent guests! Extremely nice and kind staff! Nice welcome! Great food! 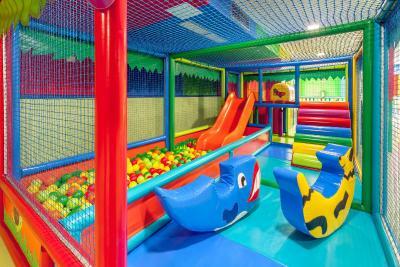 Perfect facilities! We were extremely satisfied! Everything from start to finish was perfect. The staff the food and drink perfect. Location, exterior elements & aesthetics, pool was nice as were activities. The Staff, the facility. I little noisy in the diner, but not easy with si many kids. So it’a okay. 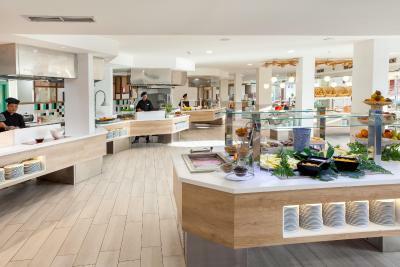 The food was very good, plenty of choice and friendly staff were on hand. 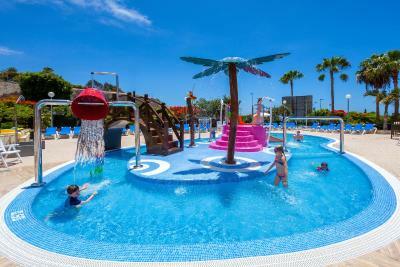 Tagoro Family & Fun Costa Adeje This rating is a reflection of how the property compares to the industry standard when it comes to price, facilities and services available. It's based on a self-evaluation by the property. Use this rating to help choose your stay! 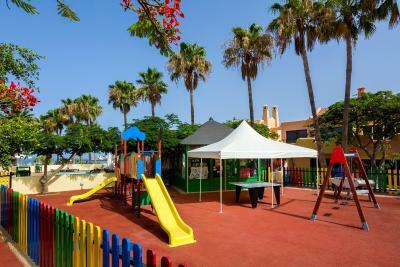 Tagoro Family & Fun Costa Adeje is located in a quiet, residential area of Costa Adeje, in south-west Tenerife. 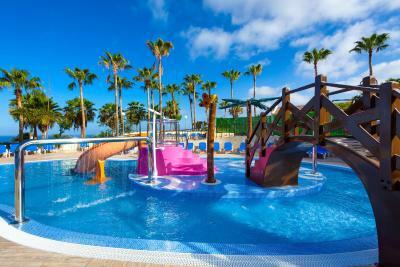 Surrounded by gardens, this all-inclusive resort offers 4 outdoor pools, 2 for adults and 2 for children. Rooms feature a private balcony or terrace. 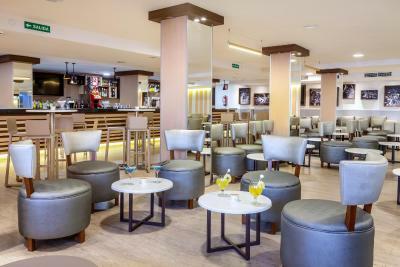 Set in Canary-style buildings of no more than 3 stories, the modern rooms feature air conditioning and a flat-screen TV with satellite channels. 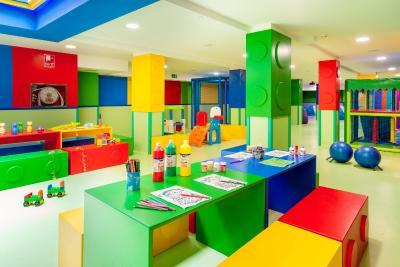 Each one comes with a private bathroom with hairdryer. Free WiFi is available in all areas. 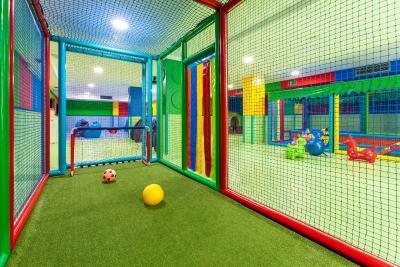 The Camelot Kids Club features 4 areas, including a ball pond, an interactive zone with Playstations, flat-screen TVs and proyectors, a mini-court for sports, and a crafts area for coloring and other manual activities. 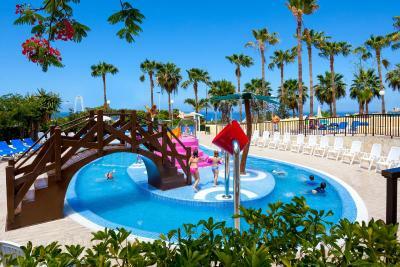 Tagoro Family & Fun Costa Adeje has tennis courts and a wide range of activities for both adults and children. 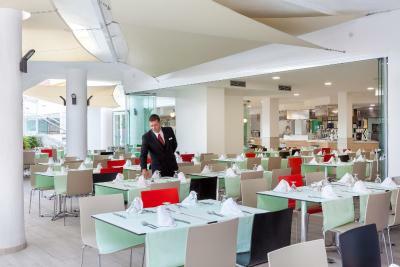 The buffet restaurant serves a range of international dishes, and there are themed dinner evenings with show cooking. 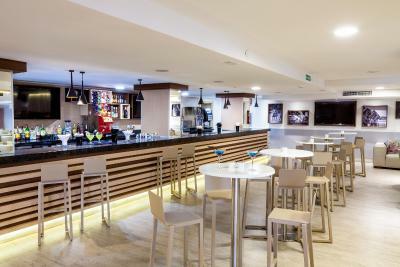 The property also features a snack bar and a pool bar. 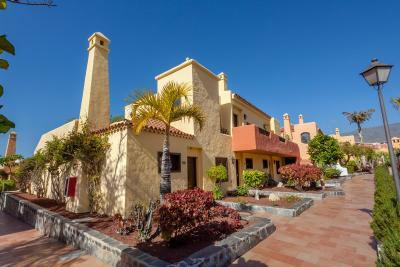 The property is just a 10-minute walk from Fañabé Beach, which also offers a free bus service. Gran Sur Shopping Center is right next to the resort. 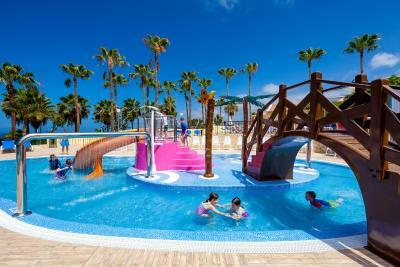 When would you like to stay at Tagoro Family & Fun Costa Adeje? This spacious room features stylish, modern décor with fresh, cool colors. 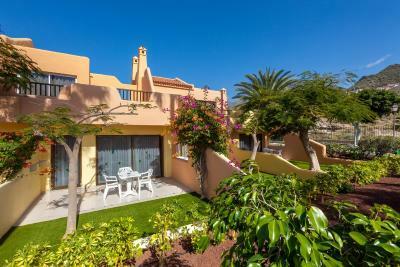 It has a private balcony with views of the gardens and the surroundings. 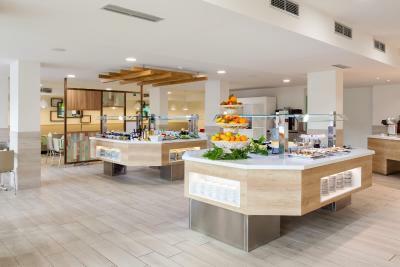 There is an air-conditioned living-dining area with a microwave, kettle and fridge. 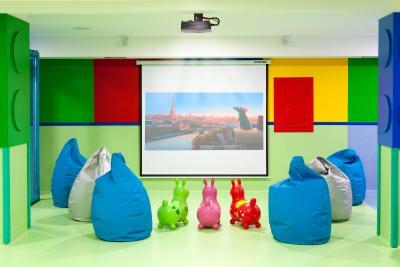 The room also comes with a flat-screen TV with satellite channels. Safes are available to rent. The bathroom includes a hairdryer and free toiletries. 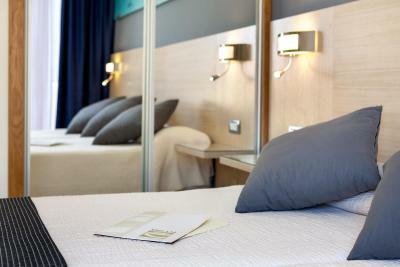 The room has 2 single beds which can be pushed together on prior request. There is a sofa bed in the living-dining room. Please note that free WiFi is available in all areas. Please note that pool towels are not provided. 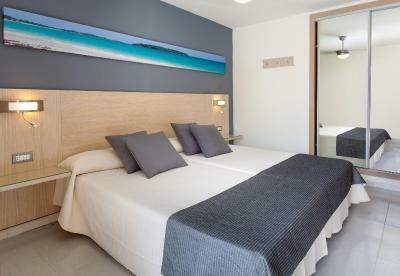 The room has 2 single beds which can be pushed together on prior request. Please, note that children age is from 2 to 12 years old. Located on the top floors of the complex, this spacious, air-conditioned room features stylish, modern décor with fresh, cool colors. 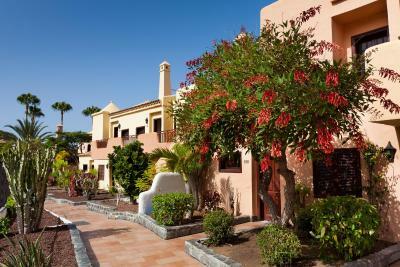 It has a private balcony or terrace with views of the gardens and the surroundings. There is a living-dining area with a microwave, kettle and fridge. The room also comes with a flat-screen TV with satellite channels. Safes are available to rent. The bathroom includes a spa bath, a hairdryer and free toiletries. 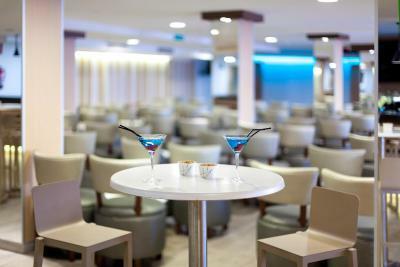 Located on the top floors of the complex, this spacious, air-conditioned room features stylish and modern décor with fresh, cool colors. 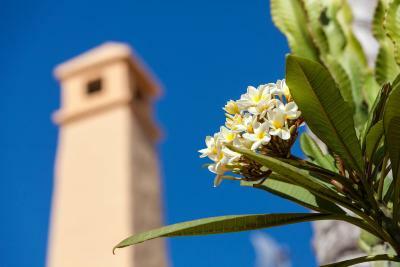 It has a private balcony or terrace with views of the gardens and the surroundings. There is a living-dining area with a microwave, kettle and fridge. The room also comes with a flat-screen TV with satellite channels. Safes are available to rent. The bathroom includes a spa bath, a hairdryer and free toiletries. This spacious room features stylish, modern décor with fresh, cool colors. 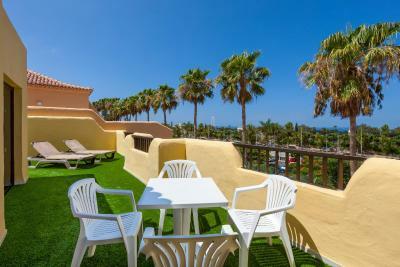 It has a private furnished terrace with an outdoor hot tub with views of the city. 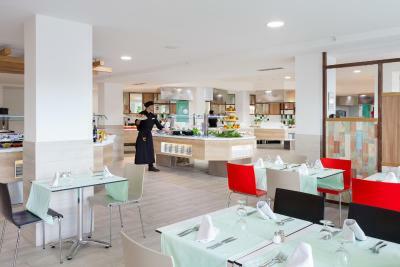 There is an air-conditioned living-dining area with a kitchen, microwave, kettle and fridge. 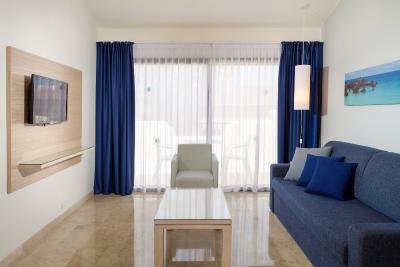 The room also comes with a flat-screen TV with satellite channels. Safes are available to rent. The bathroom includes a hairdryer and free toiletries. 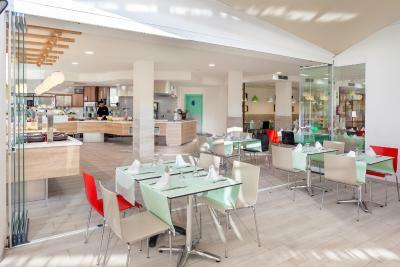 Located on the top floors of the complex, this spacious, air-conditioned room features stylish, modern décor with fresh, cool colors. 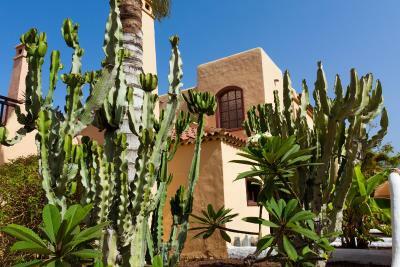 It has a private furnished terrace with an outdoor hot tub with views of the gardens and the surroundings. There is a living-dining area with a microwave, kettle and fridge. The room also comes with a flat-screen TV with satellite channels. Safes are available to rent. The bathroom includes a spa bath, a hairdryer and free toiletries. Located on the top floors of the complex, this spacious, air-conditioned room features stylish, modern décor with fresh, cool colors. 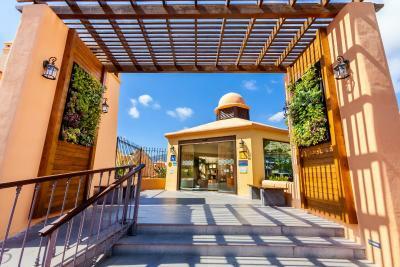 It has a private furnished terrace with an outdoor hot tub with views of the gardens and the surroundings. There is a living-dining area with a microwave, kettle and fridge. The room also comes with a flat-screen TV with satellite channels. Safes are available to rent. The bathroom includes a hairdryer and free toiletries. This spacious room features stylish and modern décor. 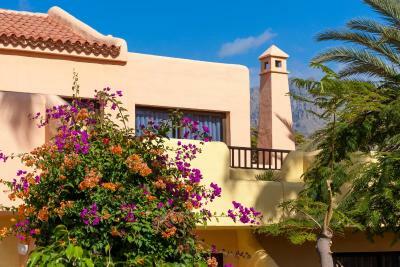 It has a private furnished terrace with an outdoor hot tub, offering views of the garden and the surroundings. 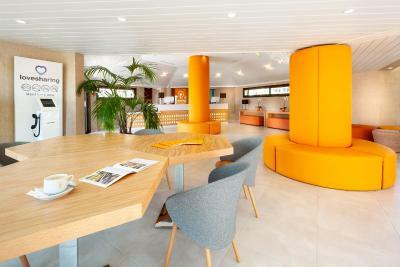 There is an air-conditioned living-dining room as well as a kitchen with a microwave, electric kettle and fridge. A flat-screen TV with satellite channels is included. The bathroom comes with a hairdryer and free toiletries. 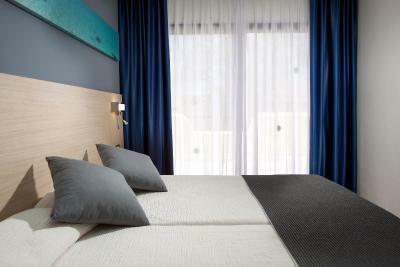 The bedroom comes with 2 single beds that can be pushed together on prior request.